Bessie Smith (April 15, 1894 – September 26, 1937) is largely regarded as the most popular and successful blues singer of 1920s and 1930s, and she has had an enormous influence on singers throughout the history of American popular music, including Mahalia Jackson, Janis Joplin, and Norah Jones. Born in Chattanooga, Tennessee, United States on April 15, 1894, Bessie Smith was one of six surviving children of William and Laura Smith. According to Smith's biographer Chris Albertson in his seminal book Bessie (1972, revised in 2003), William Smith was a laborer who also worked as a part-time Baptist preacher, but he died before Bessie could remember him. By the time Bessie was nine, she had lost her mother as well, and her older sister Viola was left in charge of caring for the younger sisters and brothers. As a way of earning money for her impoverished household, Bessie and her younger brother Andrew began performing on the streets of Chattanooga as a singer/guitarist duo; their preferred location was in front of the White Elephant Saloon at Thirteenth and Elm streets in the heart of the city's African American community. In 1904, her oldest brother Clarence left home to tour with a small traveling theatre company, and it was this decisive act of her brother's that convinced Bessie that she could make a living as an entertainer. As Bessie's niece-by-marriage Ruby Walker told biographer Albertson in 1971, "Bessie probably wouldn't have been in show business if it hadn't been for Clarence." When Clarence returned to Chattanooga in 1912 with the Moses Stokes Theatre Company, he arranged for the troupe's managers Lonnie and Cora Fisher to give his sister an audition. Bessie was initially hired as a dancer with the Moses Stokes company, a show that also included Ma Rainey, who did not teach Smith to sing but probably helped her develop a stage presence. Smith began developing her own act around 1913, at Atlanta's "81" Theatre. By 1920 she had gained a reputation in the South and along the Eastern Seaboard. In 1923, when blues had become popular enough to begin selling records, Smith was signed by Columbia records, and quickly rose to stardom as a headliner on the T. O. B. A. (Theater Owners' Booking Association) theater circuit. Her biggest recorded hit was "Down Hearted Blues", a song written and previously recorded by Alberta Hunter. Working a heavy theater schedule during the winter months and doing tent tours for the rest of the year (traveling in her own railroad car), Smith became the highest-paid black entertainer of her day. Her recorded accompaniments included some of the finest musicians of the time, most notably Louis Armstrong, James P. Johnson, Joe Smith, Charlie Green, and Fletcher Henderson. Smith's career was cut short by a combination of the Great Depression (which all but put the recording industry out of business) and the advent of "talkies", which spelled the end for vaudeville. Smith, however, never stopped performing. While the days of elaborate shows were over, she continued touring and occasionally singing in clubs. In 1929, she appeared in a Broadway flop called Pansy, a musical in which, the top white critics agreed, she was the only asset. That same year, she made her only film appearance, starring in a two-reeler based on W. C. Handy's "St. Louis Blues." In the film, which was shot in Astoria, NY, she sings the title song accompanied by members of Fletcher Henderson's orchestra, the Hall Johnson Choir, and a string section — a musical environment radically different than any found on her recordings. John Hammond asked her to record four sides for the Okeh label in 1933 after seeing her perform in a Philadelphia nightclub. These performances, for which Hammond paid her $37.50 each, were her final recordings. They are of particular interest because Bessie Smith was in the process of translating her blues artistry into something more apropos in the Swing Era, and this session gives us a hint of what was to come. The accompanying band included such Swing Era musicians as Frankie Newton and Chu Berry. Even Benny Goodman, who happened to be recording in the adjoining studio, dropped by for an almost inaudible guest visit. Hammond was not pleased with the result, preferring to have Smith back in her old blues groove, but "Take Me For A Buggy Ride" and "Gimme a Pigfoot" are among her most popular recordings. She resumed touring with some success, adding swing to her repertoire. On September 26, 1937, Smith was severely injured in a car accident while traveling from a concert in Memphis to Clarksdale, Mississippi along U.S. Route 61 with her companion (and Lionel Hampton's uncle) Richard Morgan. She was taken to Clarksdale's segregated Afro-Hospital and her arm was amputated, but she never regained consciousness and died that morning. Shortly after her death, Hammond stirred up controversy by suggesting, in a Down Beat article, that Smith was refused admittance to a white hospital and that she died as a consequence thereof. 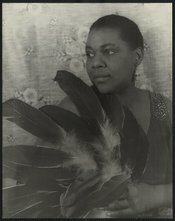 It was an unsubstantiated rumor that lingered for decades, fueled by Edward Albee's 1959 play The Death of Bessie Smith. Although made aware of the facts, and shown the evidence, Hammond never recanted his story. It was only when biographer Chris Albertson's 1972 book Bessie featured an interview with the attending doctor, Hugh Smith, that the story was put to rest. Surprisingly, given the eminence of the author, the story was repeated as fact in Alan Lomax's 1993 book The Land Where the Blues Began. Lomax's perpetuation of the myth is all the more inexplicable when one considers a letter received by his father, John Lomax, in October, 1941. In the letter, Dr. W. H. Brandon, who attended to Smith, wrote, in part: Bessie Smith was injured in an automobile accident several miles out from Clarksdale and was brought to Clarksdale in a colored ambulance....She died some eight or ten hours after admission to the hospital. We gave her every medical attention, but we were never able to rally her back from the shock. "They had heard about what happened to Bessie Smith in 1937 in their hometown," Lomax wrote. "Wounded in a local car wreck, the great blues singer was refused admission to three Clarksdale hospitals because she was black. In the end she bled to death without medical attention, while her friends pled with the hospital authorities to admit her. And this incident was typical of the Deep South." While Lomax claimed that this alleged incident was "typical" of racism in the South, the doctor who tended to Smith on the scene (quoted in Chris Albertson's book) confirmed that it was extremely unlikely that a black ambulance driver would have taken a black patient to a white hospital, especially when there was a nearby black hospital. The driver in question told writer George Hoefer, twenty years later, that he had taken Smith straight to Clarksdale's black hospital, which has been confirmed, but he also maintained that she had died en route, rather than bleeding slowly to death on a stretcher while waiting to be admitted. As we see, that part of his story was incorrect. Smith was in fact still alive when she was brought to the hospital, in the middle of the night, but she never regained consciousness, and died that morning at 11:50. A more recent play featuring fourteen of the songs Smith made famous, The Devil's Music: The Life and Blues of Bessie Smith by Angelo Parra, was named one of the "top-10 Off-Broadway experiences" of 2001 by the New York Daily News.